My name is Guadalupe. I feel blessed to tell my story because my story is not about circumstances; my story is about me. I’m studying mechanical engineering at Texas A&M University. Being the oldest, I thought no one but me would aspire to such an improbable feat. “Undocumented women studying engineering” is not a common theme in my family. But, interestingly enough, now it is. Now my sisters light up when they say, “I wanna be a doctor!” And my two undocumented sisters want to attend A&M, too. When we don’t encourage just one child, like me — first-generation and low-income — we are discouraging an entire community of trailblazers from molding the very landscape of our everyday life. We need them, but this story is about me, nonetheless. It’s about the 20-year-old girl who might not be able to afford her school coming this spring 2018 but has made up her mind. She’s the undocumented woman studying mechanical engineering at Texas A&M University, and she’s quite willing to share her story to help herself be the conscientious leader the world demands. 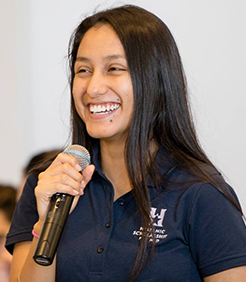 Guadalupe Estrada is a mechanical engineering student and DACA recipient from Houston, Texas. THE DECISION BY THE TRUMP ADMINISTRATION to end the DACA program without first having a solution in place for otherwise DACA-eligible youth has put America’s future at risk. A majority of voters in swing districts across the country believe that ending the DACA program was the wrong thing to do. Guadalupe is a good example of how significant it would be to lose an entire generation of talented and motivated people because they can no longer live, work, or study in the U.S.
Like Guadalupe, 72 percent of DACA recipients who are currently in school are working toward a bachelor’s degree or higher, and 94 percent say that because of DACA they were able to pursue educational opportunities that they could not have pursued previously. Congress has an opportunity to choose a stronger future for the United States by creating a permanent solution for these young immigrants who’ve been so committed to improving themselves and their communities. To learn more about what you can do to help people like Guadalupe, visit www.nilc.org. And you can do more: Call Congress at 1-478-488-8059 and insist that your senators and representatives support and vote for the bipartisan Dream Act now! This entry was posted in Uncategorized on February 15, 2018 by Richard Irwin.